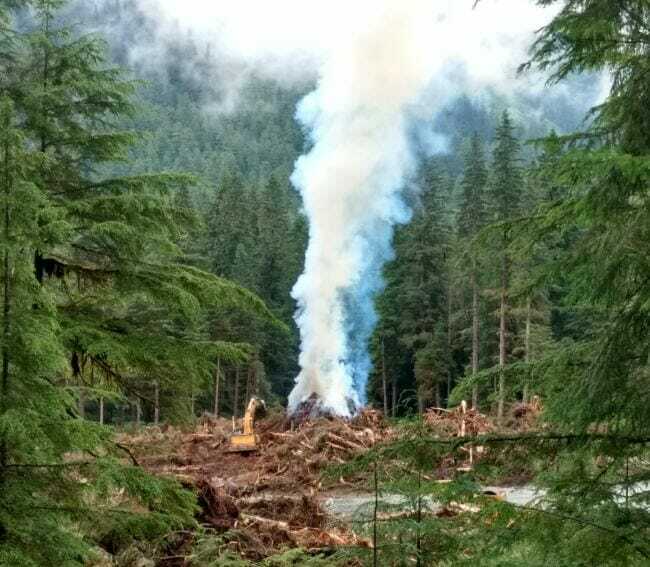 Central Council of Tlingit and Haida Indian Tribes of Alaska remains mum over the purpose of an intensive land clearing operation on Douglas Island. It’s on land leased by the Juneau-based tribal government. 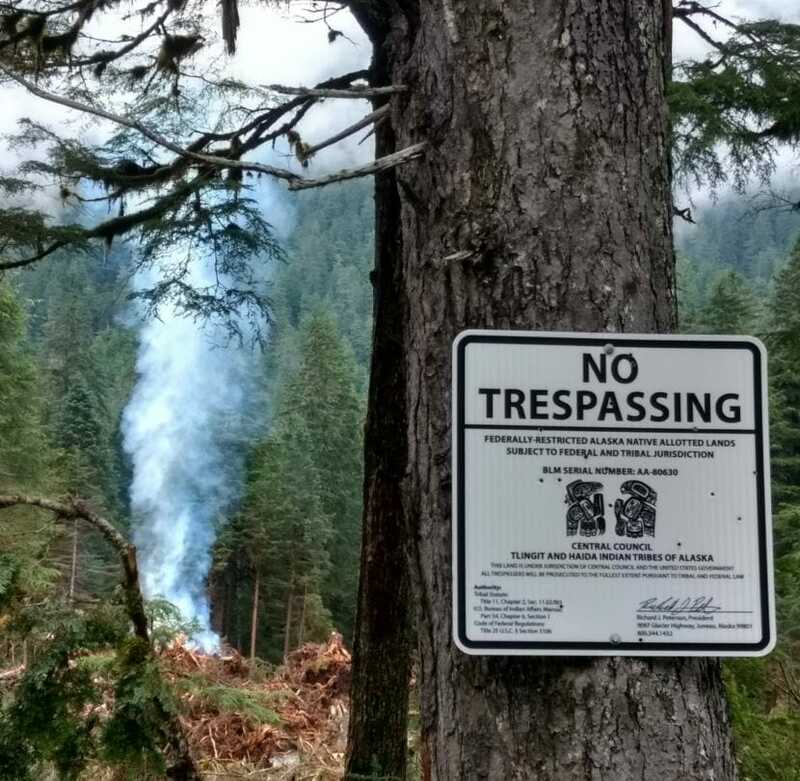 On Tuesday, smoke billowed from a clearing in the forest near the Eaglecrest Ski Area. An excavator loaded felled trees and piled brush into a smoldering burn pile. “No Trespassing” signs emblazoned with Tlingit and Haida’s tribal logo are visible from the road. Asked about the work, Tlingit and Haida, one of the largest tribal organizations in Alaska, pointed to a 2016 statement by the its president Richard Peterson. “While Central Council has long been interested in resuming its bingo operations, its overall focus is on developing a diverse retail, cultural and entertainment project,” Peterson wrote in August 2016. Holmes added that the tribe would release more information in the future. But that doesn’t shed light on the tribe’s plans for a property with an an interesting history and a complicated legal status. It’s owned by the heirs of an Angoon man who once held about 100 acres on Admiralty Island. In 2002, the U.S. Forest Service swapped that land for 220 acres on Douglas Island. In 2015, the heirs leased 20 of those acres to Tlingit and Haida, which began clearing land in mid-June. Juneau City Manager Rorie Watt said he’s had conversations with the tribe’s leadership. “I know they have conceptual plans to build some type of cultural center and I’m not sure on the exact details,” Watt said Wednesday. Speculation arose that the tribe was interested in gambling operations after Tlingit and Haida registered its gaming ordinance with the National Indian Gaming Commission, the federal body that has some oversight over gambling on tribal lands. In the 2016 statement, the tribe also ruled out casino-style gaming but said it’s interested in restarting its bingo operation. Tribes can’t run gaming just anywhere. It has to be on sovereign lands known as Indian Country. One way is for the land to be put into federal trust, a process that’s been fraught with legal controversy in Alaska and recently stalled by the Trump administration. Another type is tracts ceded to individuals under a 1906 law that allotted land to Alaska Natives. This acreage on Douglas Island was swapped for one of those allotments. There are also legal questions over whether allotments in Alaska are fully sovereign Indian Country. Alaska’s attorney general wrote a legal opinion in October 2017 saying that question remains untested in the courts. But the opinion cited case law from other states that suggested it could be.